With the common name of Butterfly Agave, Agave potatorum is a very attractive variety from Mexico. With a very neat symmetrical growth habit and blue/grey foliage that is tinged with ed in winter it makes a good specimen plant. The foliage itself is fleshy and armed (it has spikes) so get this one away from traffic areas. Like all Agaves it will flower and this will take a number of years. The flower spike is tall, the flowers green with red. Like many Agaves, the plant was used traditionally to make alcoholic drinks. 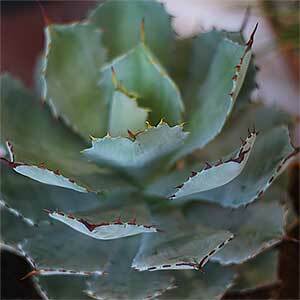 Grow this plant in a specialist cactus and succulent potting mix in a container as a feature. In frost free areas use it in the garden as part of a succulent garden or xeriscape design. Propagation is by the removal of offsets (pups). Look for A. Potatorum Kichiokan which in our opinion has the best foliage. Common Name – Butterfly Agave, Verschaffelt agave. Soil – Humus rich to sandy, well drained. Spread – To around .5 metres. Flowers – Green with red. Flowering time – In winter as the plant matures.